I have the honour of giving the keynote speech at the gala evening of the National Campus/Community Radio Conference, the yearly gathering for the National Campus and Community Radio Association here in Canada. 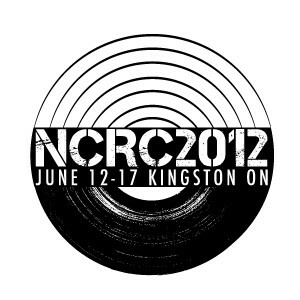 Takes place June 15, 2012, in Kingston, Ontario, hosted by the mighty CFRC 101.9FM, who are also celebrating their 90th anniversary of radiophonic activity. I’ll be talking about resonant versus radiant paradigms for radio, illustrated by speculations and curiousities regarding the Radio of the Future, including the search for extraterrestrial life, whales, and some little people stuck inside the black box. You know, my usual pet topics. I’m also sitting on a panel about radio art from 15h-17h, with Darren Copeland of New Adventures in Sound Art and Montréal artist Andrea-Jane Cornell. Then I’m zooming off to London, England for the Supersonix Conference, hosted by the Society for Literature, Science and the Arts Europe, and Exhibition Road Cultural Group, June 21-23, 2012. I’ll be giving a paper entitled “A Noisy Field of Relations: Radiophonic art and vital materialism”.